Ditch the winter blahs and enjoy the Saint Rose Camerata’s intimate evening of chamber works, each featuring no more than three performers. The performance, which is free to attend, will take place at 7:30 p.m. February 16 at the Massry Center for the Arts, 1002 Madison Avenue, Albany. Share the secret pain, struggle, and passions of the mysterious, androgynous Mignon in Hugo Wolf’s “Mignon Lieder” (1888-89). The popular four-song selection is taken from Wolf’s 51 Goethe songs encompassing nine lyrics from “Wilhelm Meister’s Apprenticeship,” the coming-of-age novel written by Germany’s favorite literary son, Johann Wolfgang von Goethe. Enjoy the compelling melodies of Slavic folk songs in Antonin Dvořák’s “Dumky” Piano Trio No. 4 (1891). Notably deviating from classical chamber-music stylistic traditions, the work consists of six movements that alternate introspective, melancholic sections with exuberant, dancelike passages and allows each soloist to sparkle in turn, warmly supported by the other musicians. Sway to the lilting tunes of the Appalachians in Robert Beaser’s “Mountain Songs” for flute and guitar. The song cycle livens up familiar old American folk tunes like “Barbara Allen” with fresh melodic and harmonic treatments and plenty of virtuosic passages, without ever straying from their down-home, foot-stomping roots. 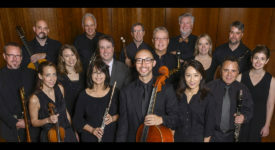 Artists for this performance include Camerata director Yvonne Chavez Hansbrough, flute; Margaret Lampasi, soprano; Jamecyn Morey, violin; David Bebe, cello; Paul Quigley, guitar; and Young Kim and Josiah Stocker, piano.